That which you neither sought, nor cared to use! Tessimond has joined the ranks of the lesser-known poets. A poet who certainly deserves our attention – who in his own lifetime was hugely popular – but who now is perhaps only known to a few. I want to briefly explore how that might have come about. Nicholson was by no means certain how to reply. In the twenty-four years that he had managed his late friend’s estate, this was the first he had ever heard of a Peter Black. It was a puzzling business. For one thing, this was one of Tessimond’s best-known poems – if people recognised it, as many people did, then they knew the piece with his name attached to it. Frequently he received letters from publishers asking permission to reprint ‘The Man in the Bowler Hat’, this accusation of plagiarism was a new and somewhat troubling development. There was no doubt that it was the same poem, and Nicholson was also certain that this was his friend’s work. He had known the piece for years, had heard him read it on many occasions. If there was plagiarism to be detected, it was Black who had clearly stolen Tessimond’s poem. Either that or it was an error on the part of Robin Skelton, or the publisher to whom he immediately wrote – but something stuck in Nicholson’s mind; something that didn’t seem right. The date of publication given in the Penguin anthology was 1943. Not only was the name wrong, but ‘The Man in the Bowler Hat’ had not appeared in print until Tessimond’s collection Voices in a Giant City published in 1947. Where had 1943 come from? It was a nagging detail. The authors’ index to the anthology which gave the poets’ dates of birth and death in brackets after their names gave no clues either – after Black’s name there were no brackets. He was a biographical blank. Hubert wrote to friends to see if anyone could shed any light on Peter Black’s identity. Nobody could. There was something strangely apt about all of this. Here was a poem about an anonymous man – ‘the man you looked through like a windowpane’ – being claimed by a person nobody had heard of. It was a situation that no doubt would have amused Tessimond. ‘The Man in the Bowler Hat’ was an elegy to the unnoticed in the world; to a figure such as Black, whose name itself was an impenetrable void. The one identifying feature of the man in the poem – the bowler hat – is an emblem of his everyday ordinariness, the blank uniform of the morning commuter. Like the crowd flowing over London Bridge in T.S. Eliot’s The Waste Land (1922) where the actions of ‘each man’ is identical, or in Ezra Pound’s poem ‘In a Station of the Metro’ (1912) where individuals are reduced to a mere ‘apparition’, the daily transit to work has frequently been seen as a theft of identity in the twentieth century. Man ceased to be an individual, but part of the crowd. The scene described in the poem is played out again in the opening moments of Galton and Simpson’s 1961 film The Rebel. There, Tony Hancock, furnished with bowler hat and umbrella, boards a train and looks about the compartment to take in seven other identically dressed commuters. His identity reaches a crisis point because all of his neighbours seem the same. He goes off to be an artist. But the neighbour in the poem is the reader: we are told that he ‘sat on your right in the morning train’, and in so doing we become part of the same anonymous being. Like Magritte’s faceless figure in The Son of Man and other paintings, or Beckett’s Didi and Gogo, or Chaplin’s Little Tramp, the hat gives a sense of uniformity to the wearer; a commonplace. However, where Magritte’s figure has his face obscured, the man in the poem’s face is visible, but it is ‘composite’; it is all faces, a representative image of everyone. We assume the man in the bowler hat to be everyman. It is possible to see why the mysterious Peter Black might wish to claim this poem, but these ideas could equally apply to Tessimond himself, who today can hardly be considered a household name. I would like to thank you at this stage, as audience, for coming along to a lecture on a poet that you might well have never heard of. Unnoticed, unnoticeable, in the fifty years since his death next month, he has slipped from our attention into ‘almost complete oblivion’. What I want to stress to you, is that whilst today he might not be particularly well known – his work has only recently come back into print – this was certainly not always the case. The fact that Tessimond is not much read anymore is not simply down to ‘undue neglect’ but the result of a far stranger story, in part a wilful act. In 1958, the publisher Putnam brought out a volume of Tessimond’s verse titled Selection. It was a slimmish book – thirty-three poems in total, some old-favourites that had appeared in previous volumes (including ‘The Man in the Bowler Hat’), but about half the collection was new work. It was the second-bestselling poetry book of that year, only beaten by the collected poems of John Betjeman. The Poetry Book Society made it their Autumn choice. The poet was interviewed by the Guardian newspaper. In a sense Tessimond was at the height of his career, but it was the last collection of his poetry that he would ever see published. Caught, with the room beyond the looking-glass. Stray pieces of torn words to piece together. Making the moon his mirror, weeping in the night. Twists on his heel to trap his following shadow. He is haunted by the face behind the face. He searches for last frontiers and lost doors. He tries to climb the wall around the world. A great many of Tessimond’s poems – as in ‘The Man in the Bowler Hat’ – use the personal pronoun ‘I’ to depict their subject. This is not to say that they are personal expressions – that the figure speaking is necessarily Tessimond himself. Often they clearly are not – the poem ‘The Prostitute’ say, or ‘The Occultist’, or ‘The Smart Boy’ – all are spoken by a narrator that identifies as ‘I’, but the poems inhabit lives that are conspicuously different from that of the poet. They are pen portraits. Sketches of characters that Tessimond had known in the world. Conspicuously, none of the new poems written for the 1958 Selection, do this, and here the subject of the portrait is identified as ‘he’ rather than ‘I’. The images are no less obscure than those in ‘The Man in the Bowler Hat’ – here, ‘the man in the fog’ and the ‘lost doors’ create an equally anonymous backdrop for the poem’s subject – but these images are not of the romantic himself, but his loves of preoccupations. What we see is not the sitter in the portrait, but the things he responds to, the ‘echo of his cry’. Twice in the poem we are drawn to the image of the mirror – the subject makes the moon his mirror, reflecting back is loneliness – the view he is in love with is ‘the room beyond the looking glass’, and this idea of reflection, of portraiture being reflection – forms a crucial idea. This figure, is conspicuously made ‘He’ not ‘I’ – other rather than self – it seems perhaps more reflection than portrait. ‘The face behind the face’ conveying an image of masks that has striking resonance for a man whose own identity seems to have been a constant concern. It is a powerful, humbling, tightly packed sonnet. The voice of the poem seems universal – any man – a figure adrift, scattered as if after the fall of Babel, seeking another person who will understand his stammering dialect, and yet not only aware of his inability, but understanding of it. The poem identifies common feelings – of being part of the world but being apart from it; of sought after love; of being incomplete; Adam in search of his ‘lost rib’. All of which might seem to be experiences that are felt, at one time or another, by every, or, ‘any man’. But right in the middle of the poem is something quite different – more particular than general experience. Seemingly out of nowhere the poem breaks from generality to confront us with specific geographical locations. The poem moves from the common human experience to Wardour Street in London and then from the public street to the shared privacy of the bed. For a moment the poem requires us to share its dialect, to understand its ‘private signs’ and ‘cipher’, to know the relevance of Wardour Street and the Square, and ‘decode’ the ‘signal across the Park’. Whether we can read the cipher or not, briefly we are made aware that this is not in fact the voice of ‘any man’. It is not even the voice of any man on Wardour Street. It is a particular, personal, private experience which might be understood by the reader or not – may be ‘shared by you, but not you and you’. As a portrait, this poses something of a puzzle. To fully understand the poem, we must pick up on the meaning of the personal references – but this is a poet that we don’t know very much about. There has been no biography of Tessimond, there are short accounts of him in Hubert Nicholson’s introductions to the posthumous poetry collections, and an affectionate, though brief, portrait of him in a pamphlet by his friend, the artist Frances Richards – but even in these, certain details of his life seem contradictory, as if the poet told different friends slight variations in the account of his life. In the poem we have already looked at, ‘Portrait of a romantic’ we are told that the romantic likes ‘stray pieces of torn words to piece together’, and in order to fully understand the poetry, this is what we must do. He is to be found scattered about the country in university archives of other people’s correspondence; in footnotes and index entries that lead to single sentences. In the course of my work on him I have unearthed a great deal of papers that were not previously known to exist – most important of these ‘stray pieces’ perhaps, is the revelation that for the final twelve years of his life A.S.J. Tessimond was writing a journal of his life – a daily account, but also a sort of biography, or memoir that he intended for publication. 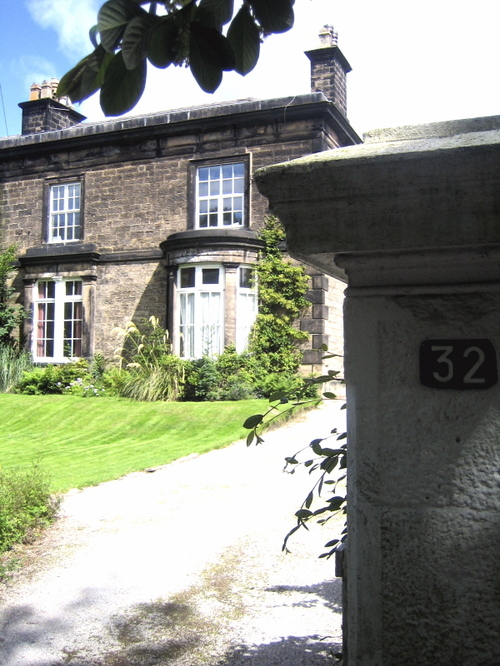 Arthur Seymour John Tessimond was born here in 32 Devonshire Road, Claughton, on the 19th July 1902. As an adult, he would tell his friends that he had been an only child, but in fact he was the third of George and Amy Tessimond’s children, his elder brother – also called Arthur – dying four years before he was born, and his elder sister Lillian dying when he was twenty-two, unmarried, in a private maternity hospital in Southport. I was born in 19–. There were still horsecabs and hansoms clopping along the streets, housemaids and cooks in ordinary middle-class houses, gaslight and croquet, tea in the green light of tall trees leaning over lawns that smelt of summer grass after the gardener had mown it, and Edward VII was king of a Land of Hope and Glory and a land of starvation in slums, and Britannia ruled the waves, and ‘the war’ meant the Boer War and stories about Kitchener of Khartoum in the Boy’s Own Paper. My father was an Inspector of Branches in the Bank of Liverpool, and we lived in Birkenhead. Trams and ferryboats across the Mersey grind and splash through my early memories. The trams (like the first London buses I rode on later) had open tops. When it rained, did the people on top hoist their umbrellas or did they all rush downstairs? I can’t remember. Our family consisted of my father, his sister Ellen, my mother, my sister Lily and I. Ten minutes walk away lived my maternal aunt Clara, her husband Dr Major and their daughter Alice. In their house was an awe-inspiring oil painting of Dr Major when he was an army doctor. In this picture he wore high shiny boots and so presumably had been a cavalry doctor. He has a fierce impressive waxed moustache. He was haughty, elegant and terrifying. His life at this time was very comfortable, much unlike the time spent there in relative poverty by his contemporary Wilfred Owen. He attended Birkenhead School until the age of 14 (where he was ‘good at lessons’ but ‘bad at games’), before being sent away to Charterhouse. This was an unhappy experience, which led to him running away. His main occupations as a child were music (his father was a key figure in establishing church music in the early days of the Anglican Cathedral) and photography, developing his own films and making prints at home – a hobby which he continued in adult life and led to a life-long interest in the visual arts. soon after I became an undergraduate I discovered two magazines The Dial and The New Age. Through these magazines I discovered Ezra Pund, T.S. Eliot, James Joyce, Wyndham Lewis, D.H. Lawrence, Frost, Sandburg, Cummings, Hulme, Aldington, H.D., Marianne Moore, Katherine Mansfield, Murry, Muir. And through the Dial and Colour and the Burlington Magazine I discovered Degas, Manet, Renoir, Cezanne, Gauguin, Van Gogh, Picasso, Matisse, Braque, Vlaminck, Modigliani, Paul and John Nash, Augustus John and Epstein. When the Diaghilev Ballet came to Liverpool, I discovered Stravinsky, De Falla, Poulenc, Ravel. To me contemporary art, literature and music were new bread and strong red wine. New gates were opening. New suns were rising. The 1920s and 30s seemed a wonderful time. God almighty, it was a wonderful time. A wonderful time to be young! 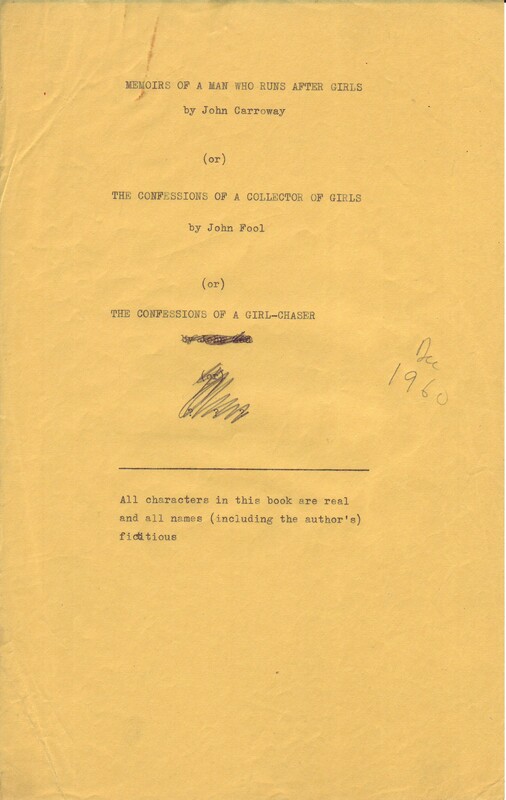 Here is the title page from 1960: ‘John Carroway’, ‘John Fool’ and most unlikely of all, ‘John God’. The codes used are hardly difficult to crack – he would have been fairly easy to identify by anyone reading the work (after all, there was hardly a glut of poets born in Birkenhead at the start of the twentieth century) – but the names used too are also telling. As the names of cakes or the categories of meat. But life is rarely simple and ‘nothing’s as tidy as the mind could wish’. By nature, identities have many different sides to them, and to an extent it is reductive to pin them down with a single label or name upon a card. What the journal presents is not an anonymous life story but an account that plays a game of anonymity, inviting us to decode its cipher. In part Tessimond’s disappearance from public view seems wilful, a conscious retreat from a world in which he did not feel he belonged. In that long list of people who caught Tessimond’s imagination in the 1920s, is the Italian painter Modigliani. Of all of these, Modigliani was perhaps the figure he held to for longest – buying a pencil drawing by him that he proudly hung in his small Chelsea flat. Modigliani’s portraits often point towards his interest in African masks – their faces seem to bare less a face, than a mask – the eyes seem empty, almost appear to be showing the wall behind the sitter – it seems the exterior image of an unknowable figure. The idea clearly captured Tessimond’s imagination. Many of his poems refer to masks – or ‘the face behind the face’ he refers to in ‘The portrait of a romantic’, and in his flat when he died, one of few objects that he had not sold, was a large African mask which he propped up against the gas fire. But even as he carried out this game of disguising himself with masks, he was consciously leaving behind traces – enough clues, enough poetry of exceptional worth – in the hope that he might one day be returned to, and then find his place within that world after he was gone. He declares the desire for privacy whilst conscious that he reveals more than ‘is usual, or (some people might think) decent’. In reality, the unnoticed man is unlikely to declare that he is ‘unnoticeable’; announcing your anonymity tends to draw attention to yourself. As it turned out, Tessimond’s life story was never published. Shortly before his death the poet destroyed the manuscript of the journal – the only means by which I am able to read today, is that just before he did destroy it, he handed a carbon copy to his friend the radio actress Joan Hart. Like the mask left behind in the flat after he died, the destruction seems an act of obscurity, but by ensuring a copy of it was safely kept, it was only an act. Whilst he was certainly playing with masks and disguises, this is only part of the picture. When he writes in the journal of his childhood that ‘I can’t remember’ the words penetrate far deeper than we might imagine. Some time in the early 1950s, Tessimond read in David Stafford-Clark’s book Psychiatry Today, an account of the relatively new treatment of electroconvulsive therapy. He had suffered for several years from what his doctors termed ‘involutional melancholia’ and had seen a succession of psychoanalysts in the hope of dispelling these regularly recurring bouts of depression. You are given a quick-acting anaesthetic, “Just a prick in your arm, it won’t hurt you” and before you come to, you’re being helped into a comfortable armchair in the cheerful room where you can smoke (shades of Florence Nightingale) and there are reproductions of modern paintings on the walls […] Four to nine shocks at intervals of (generally) a week and gradually, or suddenly, you’re out of the tunnel into the light and sun. Life is worth living, you can even enjoy it. I escorted John from the hospital again today and he seemed rather less dazed than last time, though he said he had a worse headache than usual; he has had a longer series of treatments already than the first time, but seems determined to go on with it until he gets another fit of “confusion” which he seems to have accepted as the sign that it is working. For anyone with a very bad memory to try to write the story of his life may sound like the attempt of an idiot to do the impossible; but a bad memory has advantages. It edits and abridges. It prevents you from including too much of the trivial. You remember only the gulfs and peaks of your past. You forget everything but the unforgettable. When depression engulfed him, Tessimond would stop writing the journal. 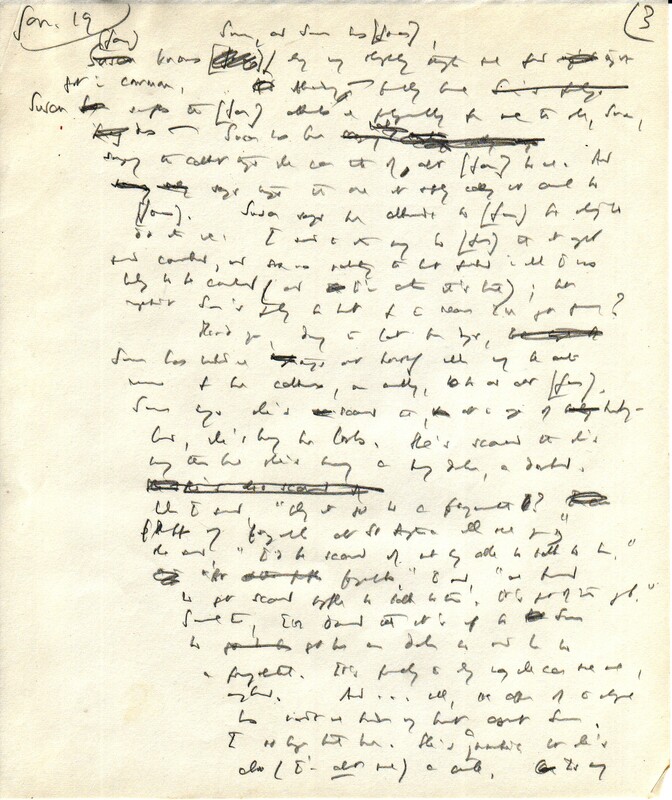 After a course of ECT he would return to it, his handwriting reduced to a series of tiny illegible shapes, unreadable even to himself, that over the course of days and pages began to reform into his usual expressive handwriting. 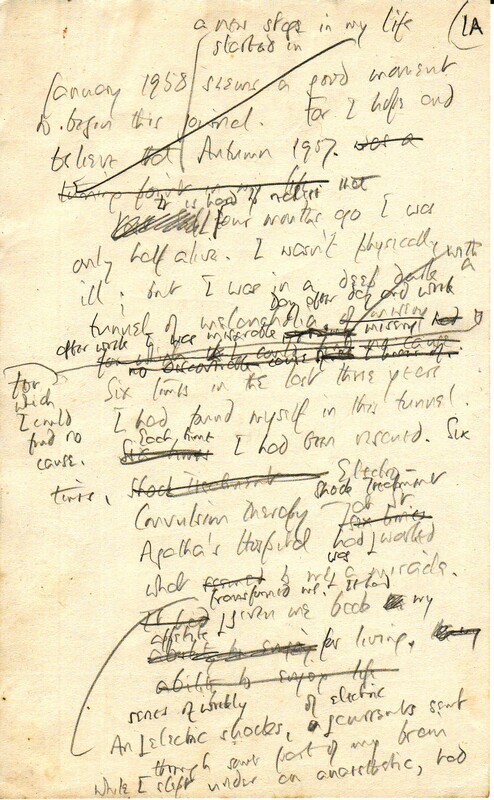 Here is his handwriting in the journal in January 1958, several months after having had any treatment. Here it is a year later, having shortly left hospital. The same effect is found in the final pages of Ernest Hemmingway’s journal as he underwent the same treatment, and may indicate that Tessimond was also receiving the antipsychotic drug chlorpromazine in combination with his ECT. Wormeaten angel, welter of dust and flame. The ‘longing’ in this poem ‘Epilogue’, is painfully felt. What Tessimond observes with keen accuracy is the multiplicity of being in the world, how seemingly contradictory states are what build people’s character. Again, this is a condition that anyone might recognise, but such observations seem pertinent to the poet himself; a man ‘longing to be / Myself’ but separated by that break in the line from the knowledge of who that self might be. In the poem ‘Any Man Speaks’ which we looked at earlier, man’s search is for someone else to connect with; in ‘Epilogue’ he gropes forward, trying to find himself. Like with portraits, the search is simultaneously inward and outward, private and public. In his own life, the poet saw himself engaged in a quest to find another person that would make him complete. The endeavour was all consuming, hopeless and romantic. He pursued love affairs with chorus girls and prostitutes, women for whom attraction was a wholly public spectacle. To return then, to those private signals in ‘Any Man Speaks’ – the ‘signal across the park’ is the dialect shared between client and prostitute. In 1934 Wardour Street and Soho Square, were the heart of London’s red light district. This is a private code, the experience of this one particular man, but in publishing it he chose to speak it out loud. Through writing the connection is made with another person; the poet connects not with the prostitute, but with the reader. So, now we have reached the fiftieth anniversary of Tessimond’s death. After years of ECT he suffered a brain haemorrhage and collapsed alone in his Chelsea flat two months short of his sixtieth birthday. There remains a need for his poetry to be read, for here speaks a great observer of human character. A general impression is that his work is accessible, which indeed it is, but few writers have struggled so much with the complexity of what it is to be alive. Thankfully his work has recently come back into print. Bloodaxe have reissued his Collected Poems and Faber has made the selection Not Love Perhaps… with its illuminating introduction by Hubert Nicholson, available again through its Faber Finds imprint. Perhaps most excitingly in this anniversary year, the Reading Room Press releases a small selection of some previously unpublished poems entitled Night Club Girl. He has left us enough visual signs – stray pieces of torn words to piece together – in the poetry and now it’s down to us to read him and put those back together. Parts of this text were previously used in a lecture ‘Not Art But Life’ given at the Lady Lever Gallery in April 2012, and in an article ‘Your Final Secret Self’ published in The Reader, issue 45. Thank you for posting all this information here!